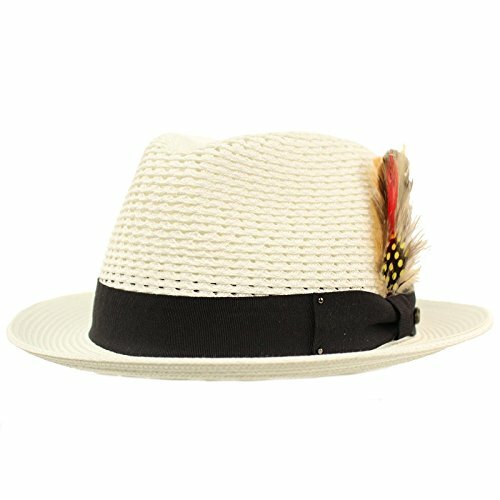 Spring Summer Light Weight Removable Feather Premium Soft Cruahable Body, Curled Upturn Brim Resort Wear Sun Hat with interior sweat band, no lining for cool comfort. Grosgrain striped pattern ribbon bow hatband. Redesigned for cool fit. Keep the harmful UV rays out of your face. Perfect for hot and warm weather outdoor activities, will keep you cool. Will compliment any outfit. How about for vacation or for resort wear. Brim: 1-1/2" Height: 4-5/8" Removable Feather: 4" x 1-5/8"